In your KitchenAid mixer bowl, combine the first seven ingredients and then slowly mix in the shortening. At this point, you can store the mix for up to six months in an airtight container in the fridge. 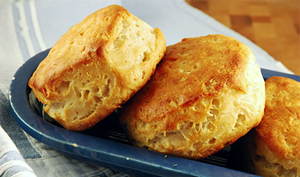 To bake your biscuits, combine 2 cups buttermilk biscuit mix with 7 tablespoons of water until just blended. Turn onto a lightly floured surface and knead five times. Roll the dough out to a ½-inch thickness and cut with a lightly floured 3-inch biscuit cutter. Place the prepared biscuits onto an ungreased baking sheet and bake at 425 degrees F for 9-10 minutes, or until golden brown.